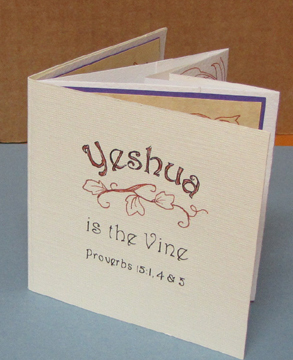 These books are made from a long strip of paper and folded accordion style. 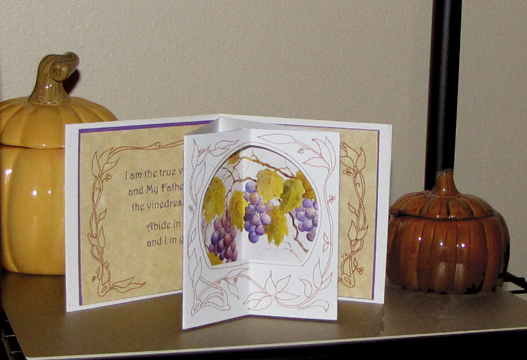 They can be plain or very elaborate with fancy papers, pop-outs and pop-ups and windows. 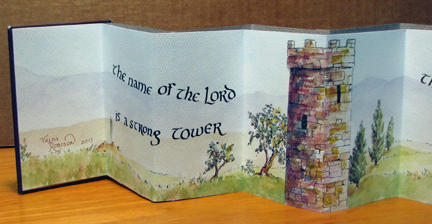 If you want to see some other types of this book, do an internet image search for “concertina book” or “accordion book”. 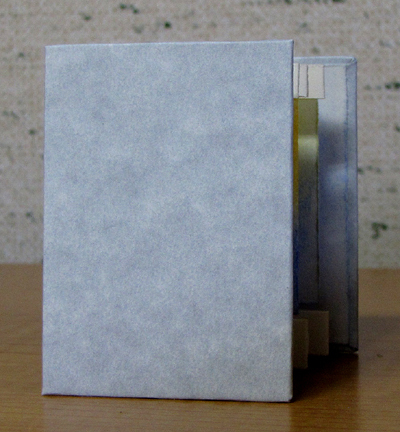 A concertina book with hard end covers. 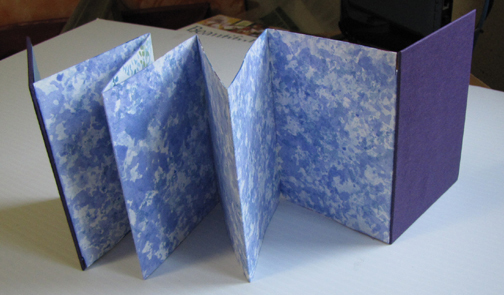 This is an unusual design of accordion book in that the center fold is made larger, and then folded back. A window is cut in the face of the fold and a picture is glued behind it, which highlights the picture. 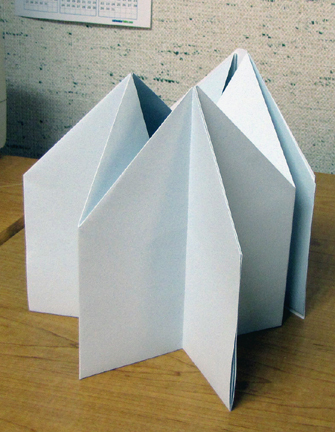 In this book the folded paper is white art paper. The inner folds are stitched together which holds them together. And the 1st and last panels are glued to a soft wrap-around cover. 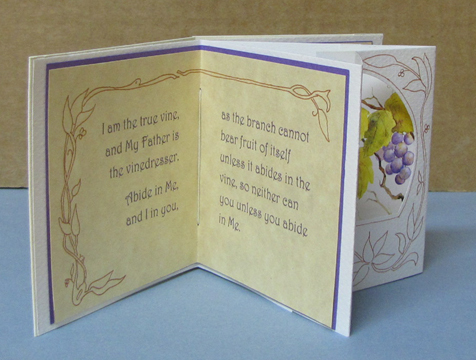 Inside the folds are the text printed on parchment paper backed by a slightly larger piece of purple paper. The book looks good on a shelf as a decoration. 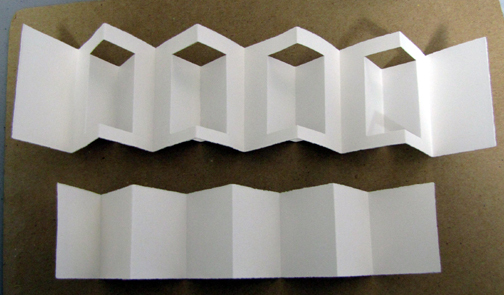 This is a type of Tunnel Book, where there are two or more layers of folded paper, and “windows” but out of the forward layers revealing what is on the last one. The little book is quite small when closed up. But when it is opened up fully, it is 4″ in diameter. Below are some other shots from different angles. It really is a fun book style with all kinds of possibilities. 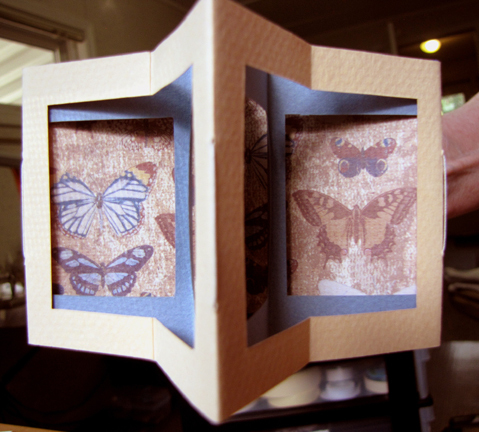 I have purchased other papers with more butterflies, but also some fun prints, and will be making more of these books in the future. This is the first of a three-volume set. Each will be of a different color, but all will be covered with handmade-type paper. 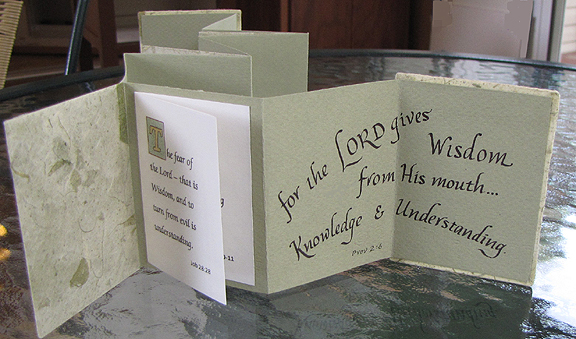 The unique feature of this book is that the green paper that comprises the “pages” started out as one sheet, 9″x12″ size, and then was folded and strategically cut so that when folded into the concertina it made one long strip as you see. Within this strip are three “pages” that stick out from the strip. I glued these shut so that they would be neater looking. Behind the perpendicular pages I inserted a printed “booklet” with text printed on it, which expands on the theme of this volume. Named because it resembles a house (I think). 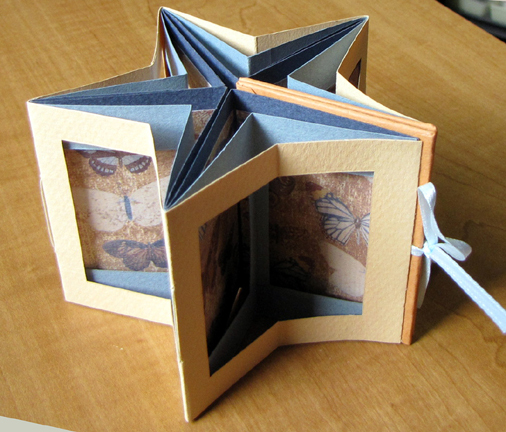 This is a mock-up of mine is of a book from Alisa Golden’s Expressive Handmade Books. 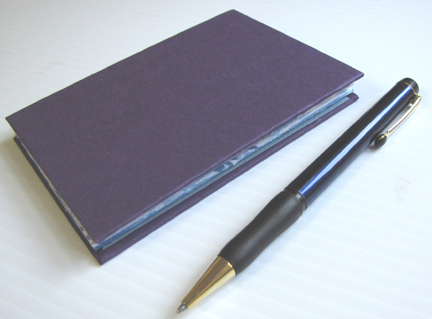 Mine has a white cardstock cover with blue stationery for the pages. There’s a lot of folding and gluing to this book. Interesting, though. 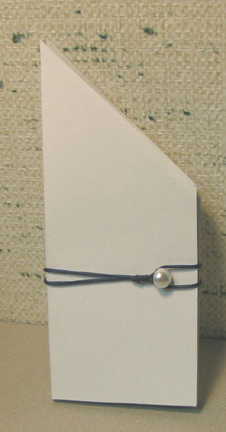 Folded with a wrap-a-round clasp. Opened up, view of the lower edge. 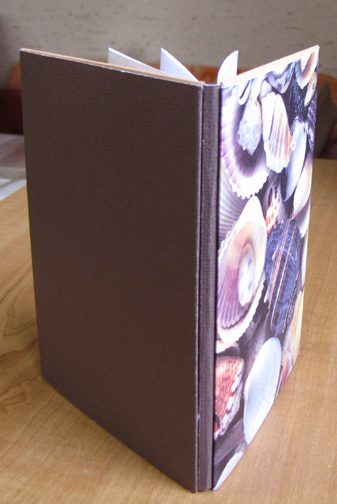 From this view, of the lower edge, you can see the accordion structure of the pages. 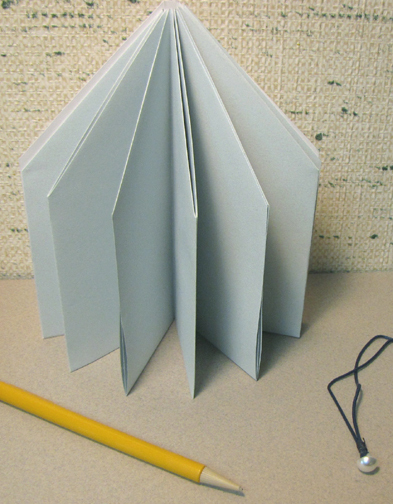 The top of the pages has been folded to form a point. 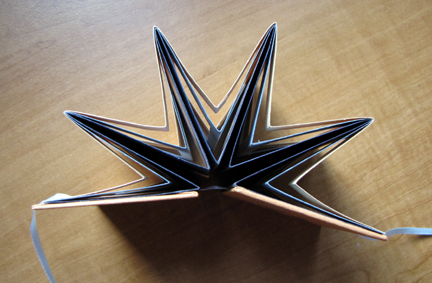 If I pull out the center page and open up the accordion, I get an interesting paper sculpture. 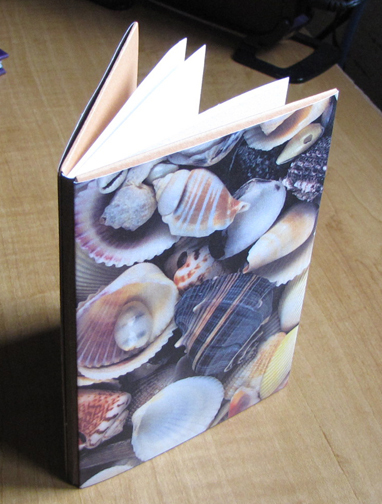 Another accordion book with hard covers. Front and back of the accordion was painted with watercolor. A couple “windows” were cut out and dark paper “patches” were glued to the back side. 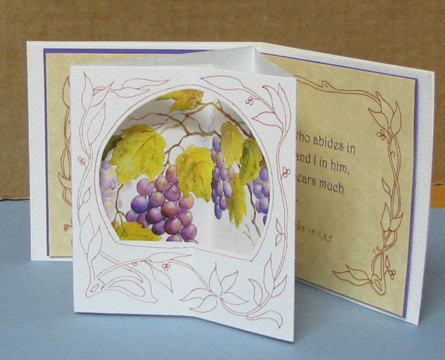 The book covers were wrapped with a decorative paper from the hobby store, and the circle theme was carried over to the inside (and backside, too). Most of these circles were cut out of paper and glued in place, but a few were painted on. The book sort of “evolved” as I worked on it. The circle theme gives it a happy feel, I think. I want to letter in some text – but I’m not sure what this will be, so it sit as is for the time being. 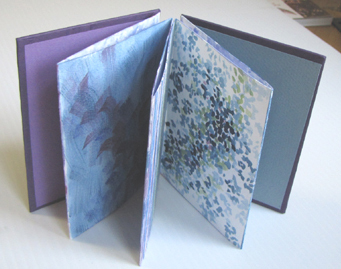 This type of layered accordion book add complexity and interest. 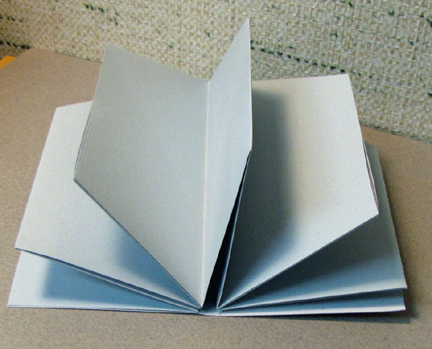 There are slits cut horizontally and the inside paper is folded back in the opposite direction as the book fold – causing a “window”. 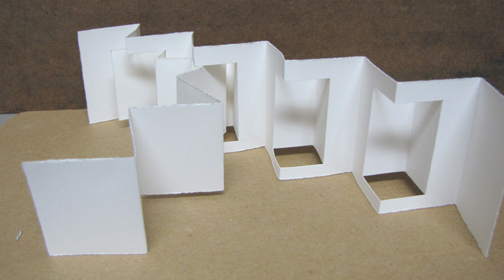 Then a second strip of paper, cut to fit within the openings, is decorated, folded, and nested into the windows. Even all white this is a striking sculpture with the shadow play on the facets of the folded paper. So I took out the center strip and gave it some color using pastels. I really liked the result. 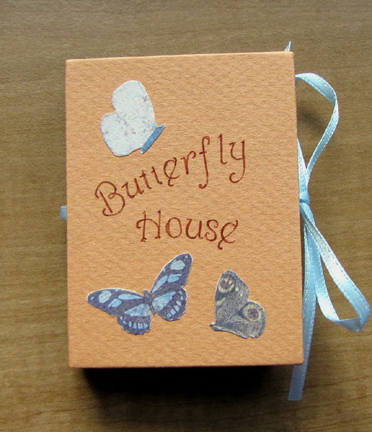 And with this color in mind, I chose a blue parchment stationery paper to cover the covers. 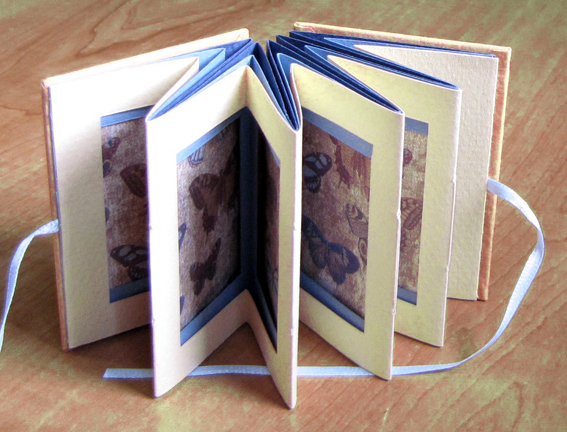 The end pages of the accordion were glued to the inside covers, and given a blue stain with the pastels. 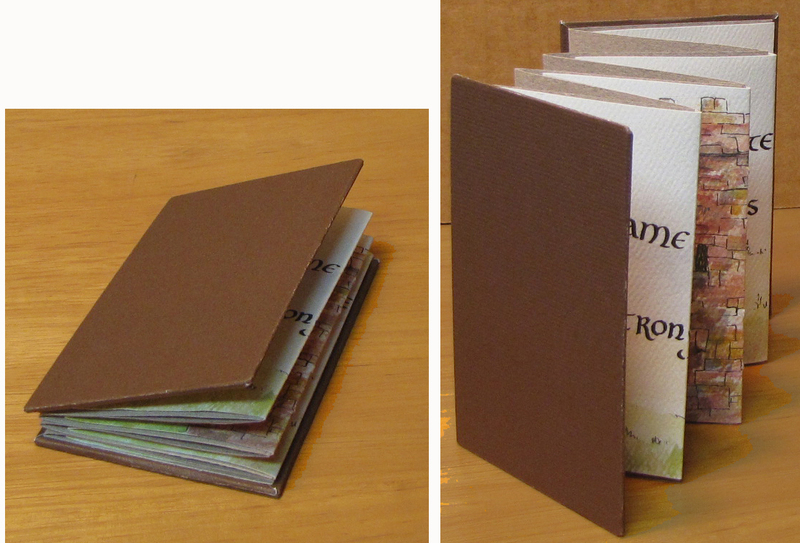 Thus, the covers are parchment on the outside, and colored paper on the inside. This clever “bound” accordion is assembled with no glue. 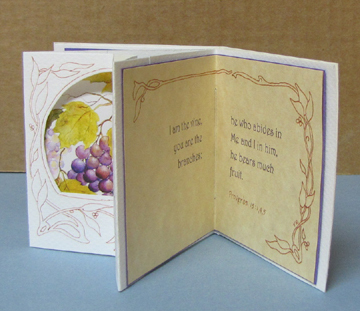 The front and back covers of the book are covered with decorative paper, cut in a way that they tuck into each other, securing the papers, and another piece of paper is tucked around the spine to keep it together. 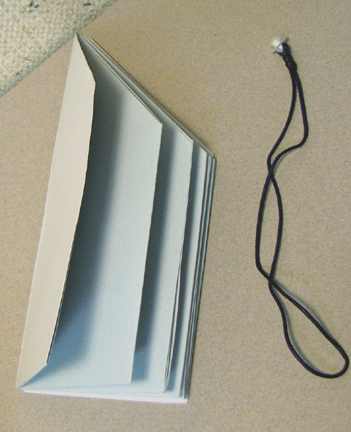 Then the end “pages” of the accordion strip are tucked into the covers, which holds the pages into the book. The book lays flat when opened. In this practice book the accordion was not very long, and I only have three pages in the book. But if I were to do another one, I’d want to have a much longer accordion so I could have 6-12 pages. One nice feature about this book is that the pages, since they are not glued or stitched into the book, can be removed and a new set inserted into it. Just a thought. 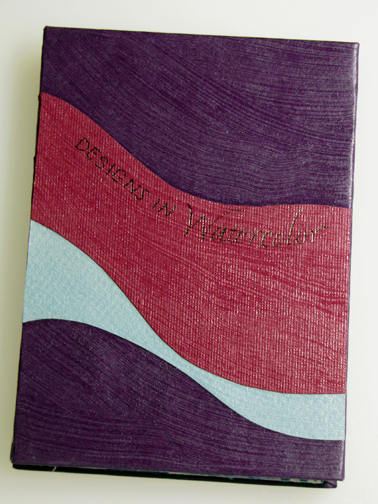 Blues and violets in several textures and designs – like a sampler. 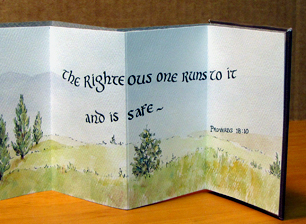 Pages are painted watercolor paper. 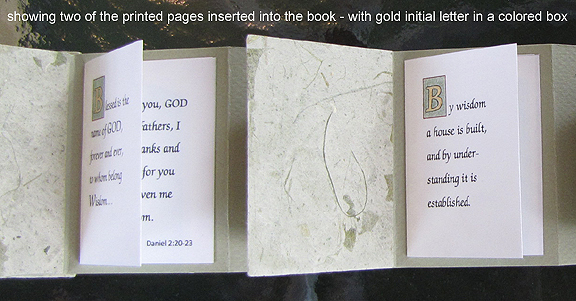 This book is not meant to be written in but to display the artwork. 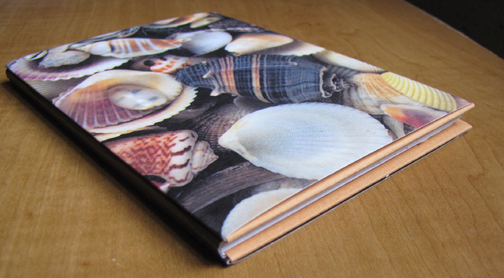 The front and back covers are glued onto the accordion – they are mat board covered with colored papers. 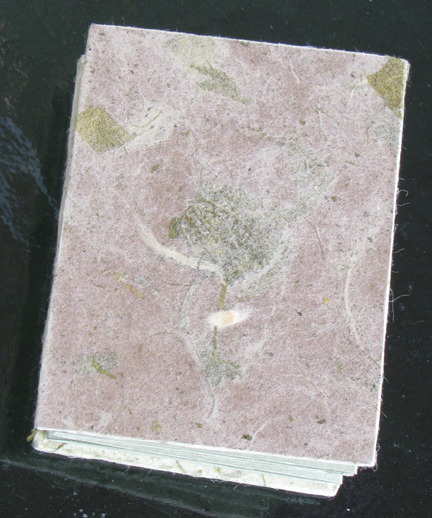 The marbled effect was made by applying several layers of paint with a sea sponge. 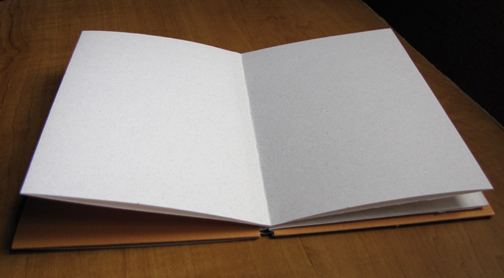 Here’s a shot of all the pages with the book stretched out. Because I had accidentally got some glue on the front of the cover, and when trying to remove it I roughed up the paper – I reworked the cover. Added some colored paper and coated it (and the back cover also) with a gloss medium. Then, when that was dry, I wrote the title in ink. I’m much happer with how this looks – makes it look like there’s something fun inside.